HEART is a 501(c)3 Public Charity and a Washington State tax exempt, charitable organization that specializes in the rescue and rehabilitation of horses that may be candidates for euthanasia specifically for the purpose of returning them to a useful life working in educational and school horse programs including one for economically disadvantaged children and adults. RRA's extensive history working in both equine rehabilitation and riding instruction makes us perfectly suited to work with both the horses and students who participate in HEART programs. 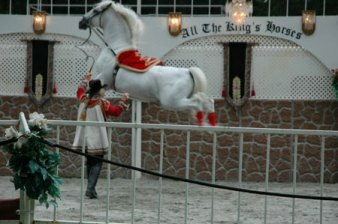 This page has information about horses who are already involved in HEART's rehab and lesson programs. To donate funds for rehab, to sponsor lessons for a disadvantaged child, to receive an application for scholarship for your child, or to receive an application for a horse donation, please contact Michelle via email at bmkb65@hotmail.com. AND REMEMBER! Your contributions to HEART are tax deductible donations to a federal 501(c)3 public charity. Help make a child's dream come true! Make a tax deductible contribution to help HEART get the Scholarship Fund started. Your help makes sure that young people who would not otherwise have a chance to be with a horse actually have the opportunity to do so. Help us make sure they know that NOTHING is impossible! Taylor H., Spokane Wa "School District"
Nicole G., Veradale, Wa "School District"
Abigail G., Verdale, Wa 2nd place, "School District"
Help build the 2019 HEART Scholarship Fund even bigger now! The HEART General Fund functions to pay for care for the horses in rehabilitation or working in HEART programs. Feed, farriery, veterinary care, supplements and pharmaceuticals that the horses need to stay happy, comfortable and sound are paid for by sponsors and donors like you. Every horse rescued and returned to a valuable life is a horse that is safe and cared for while taking care of young people who love horses. Help us continue to insure that they are loved and make a difference in the life of a child. DONATE TO THE GENERAL FUND TODAY! The horse training DVD "any Horse, any Rider" features 6 very special horses. These horses are dressage horses, western horses, hunters and recreational horses. At RRA many of the horses have had issues that we have helped them overcome through dressage training techniques and various therapeutic methods. Some have been seriously starved, others have had illnesses and injuries that were literally life threatening. Most people would not have tried to save them. Several of the horses were actually scheduled for euthanasia but were donated to RRA instead. Through careful treatment and management protocols, these horses have not only been saved, they have recovered to lead useful lives in the RRA horseback riding lesson program. The video below is called "Every Horse Is Worth It" and it tells the stories of the RRA horses that appeared in the horse training DVD "any Horse, any Rider." You will find it as a bonus feature on the DVD as well! When you make a donation here on the website the proceeds go toward taking care of the horses that come to HEART. With your help, we can continue to do what needs to be done to help heal these animals and return them to a working life loved by children and adults alike! At the left, follow the links to see photos and video footage on the pages that tells the stories of the horses. Some are rehab horses, some are horses that have been in training, some belong to the breeding program but all of the stories are interesting. Enjoy! Join us for "Dinner and a Show"
See the Drill Team perform, watch the "Parade of Breeds", hear the rescue horses stories and enjoy a delicious Prime Rib dinner! Use PayPal and your receipt is your ticket! 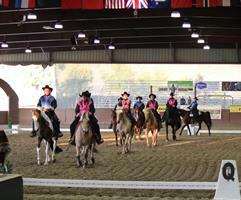 Watch the drill team at Cowboy Dressage World Finals! Watch Favory Ilke III at a 2013 HEART Grant acceptance performance. Many horses have been helped over the years. Starvation cases, lameness, illness, retirements and horses whose owners just can't keep them any longer. 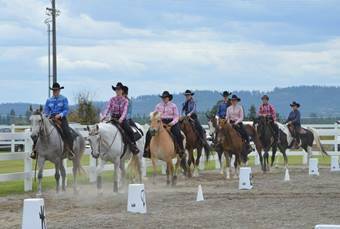 Use this link to watch the HEART horses in action with their volunteer riders perform the first HEART Drill Team ride at the 2014 WILD WEST KIDS CARNIVAL held in Cheney Washington. Charlie, Abbey, Mercedes and King have found new homes! Some of the horses in the rehab program are ready to go to new homes! With their rehabilitation complete and now with several months of riding in the lesson program, a select few of our special horses are ready to move into new careers with you. In order to open up space for new rehab projects to come in, we need your help in "rehoming" the ones that are ready. 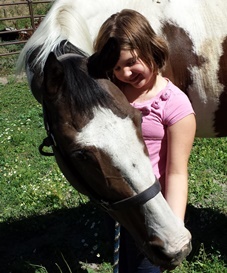 Please email us with your request to purchase or adopt a HEART horse. Click on the name of the horses at the left for more information about horses in the program.